Loving the song, but unsure of the equation that brought this to my attention. 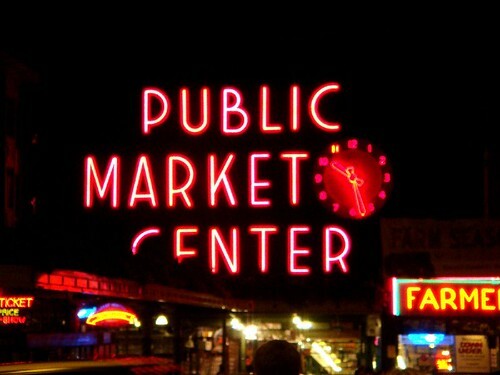 More Animoto fun with the Walkmen’s Killer track The Rat and some photos from our trip to Seattle/Bumbershoot. So, I was all excited to share some more photos and stories of Tom foolery that was the Bumbershoot-Seattle ’08 Trip. I was going to create a new Animoto video with Saul Williams – List of Demands and splice it with some killer photos. It was going to be epic… But instead I ran into a horrible case of the mondays. So, Instead I leave you with a clip of Saul Williams spoken word poetry from what appears to be SXSW’08. Saul Williams “Spoken Word” from David Delloso on Vimeo. Saul Williams was quiet possible the most impressive act we saw at Bumbershoot. Confident, Enthralling, Intellegent and Compassionate – his spoken word session was a joy to be apart of and a dramatic shift from pretty much anything we saw that day. One day in the Emerald City in the books and one and half more to go… Including a full day under the shadow of the Space Needle at Bumbershoot. Now considering we’re only going to be in the Emerald City for an insomniac 60 hours, it’s might be a little odd to blog about Seattle… But considering the summer’s lack luster excitement and constant kicks to the groin, I’m gonna do it anyways. …The Hurricane Cafe is the best dive bar breakfast in the City…Hands down. …The Monorail is always epic. 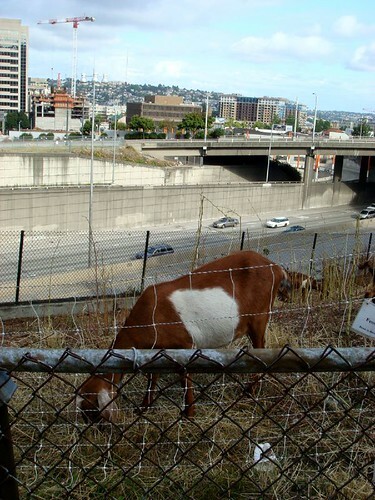 …This city has an herd of Goats that goes around cleaning up the urban landscape for Dog Parks. It was very odd to come across a random selection of goats in Seattle. They might not have the Supersonics anymore, but on a scale of 1 to 40, Seattle is still freaking awesome. Okay, maybe I’m about 15 years late to the game. But Seattle is still freaking awesome! First – Hey! Have you ever asked yourself where did my Scrabolous go? Well, it got shut down … and here’s why. Second – The American Movie Channel has ordered Twitter to shutdown the MadMen Twitter Character Profiles. (via. poploser) Considering the amount of buzz these small accounts were creating, i think this was probably a very weak decision. Third – Why do the Democrats hate Arby’s? … here’s a more important question do the Republican’s like Subway? Second – From The D.A. – A web site that tells you what song was number one on the day you were born. All I can say is … Won’t you take me to … Funkytown … FUNKYTOWN! Fifth – While Internationally it sounds pretty ridiculous, I actually applaud Air Canada’s Jazz airlines decision to remove Life Jackets from regional flights. When flying from Saskatoon to Calgary, it doesn’t particularly matter if I have life vest… In fact, if I need to use a life vest on a flight across the prairies, I’ve got far more to worry about. Sixth – I knew it! I knew it! I knew the Obey Obama – The Obama Overlord posters would surface at the convention. Eighth – But at least we get to see the Weakerthans, Saul Williams and motha f$%^in T.I. … Wonder if he’s going to play What You Know About Math? Because that would be epically awesome. Ten – If you’re keeping track the c.t.overdrive awesome count for this post is at 5.